A beautifully eye-catching Easter gift that’s fun to make, and is a great alternative to giving chocolate. 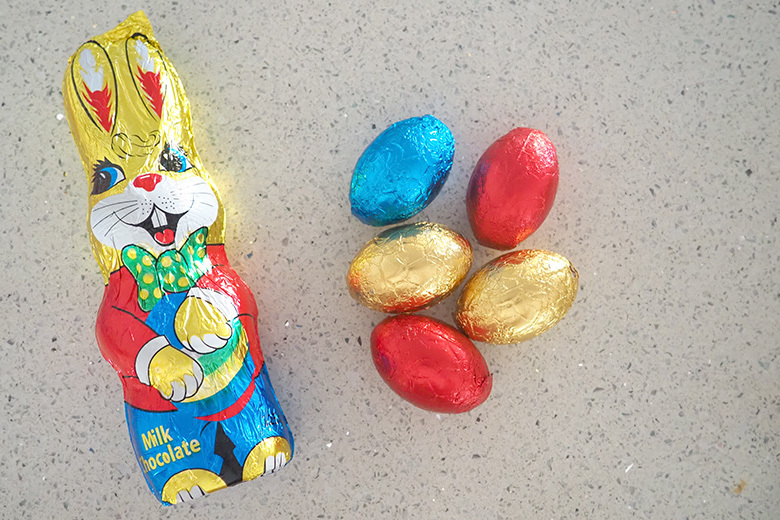 I love gifting unique presents to my friends, family, and even my kid’s teachers at Easter (well not so much now they are in high school but when they were younger it was a lovely gesture), and this gift would have to be one of my Easter favourites. It’s simple (and fun!) to make, and is one the kids can get in and help create too. 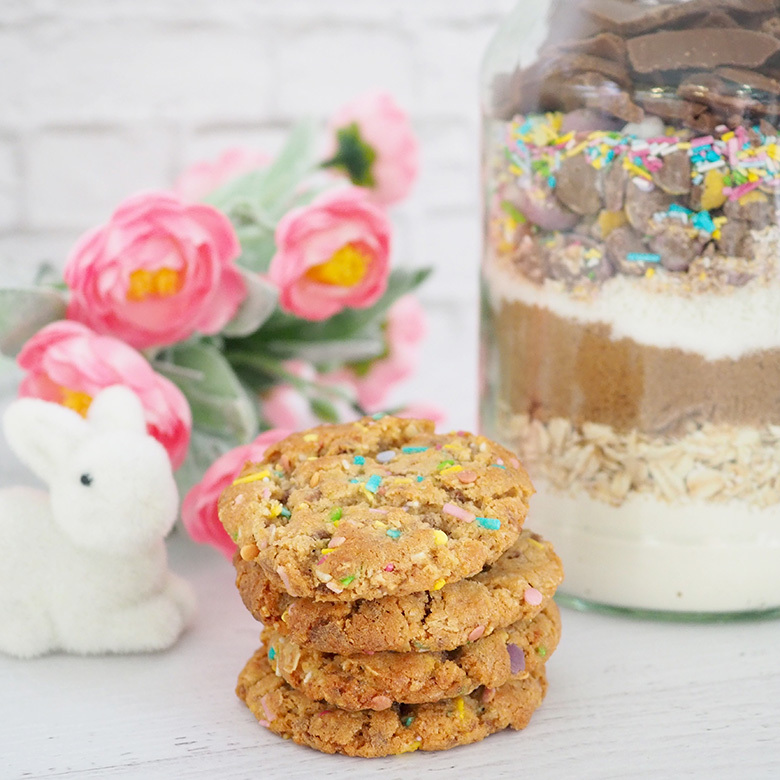 The gift of a DIY kit like this one, means your friends and family can then make their own batch of Easter cookies (or biscuits) quickly and easily at home – and I promise you these cookies are delicious! My hubby struggles to stop at 2. 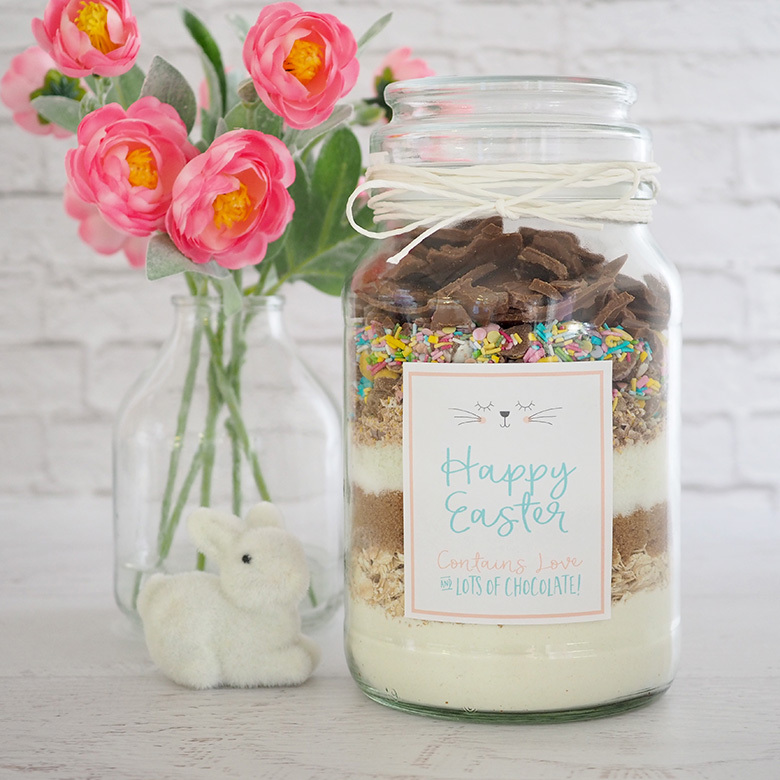 Here’s my tips and recipe to make assembling these Easter Cookies in a Jar as simple and timely for you as possible – I’ve even created Easter Cookies in a Jar Labels you can download and print from my shop, to save you more time! You can use whatever large jars you have on hand, but keep in mind it needs to be large, at least 1 Litre. I love to save and repurpose items wherever I can (waste not want not), so I used Moccona coffee jars to create my Easter Cookies in a Jar (they make the best containers!). If you choose to up-cycle a food container, just make sure you wash them in hot boiling water and allow to completely dry before adding ingredients. If you don’t have any on hand, these 1 litre Clip Lid Glass Canisters from Kmart ($3.00) will do the trick too. 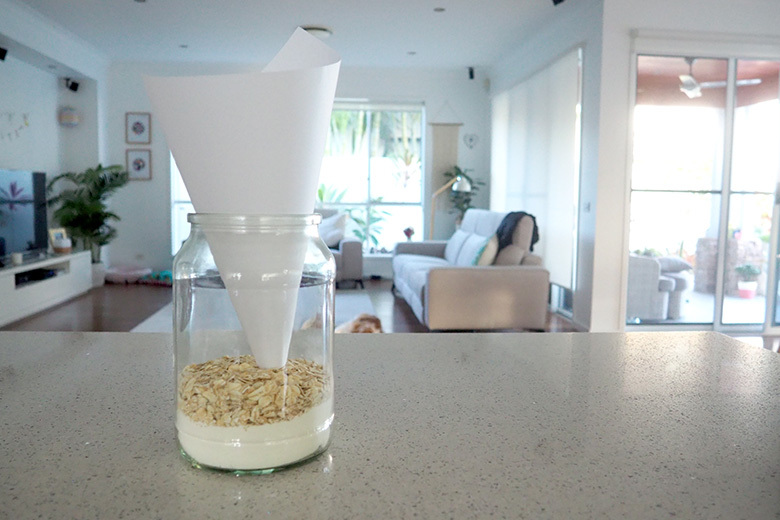 I made a piece of paper into a funnel so I got the flour into the jar without making the whole jar floury, as when it hit the bottom with impact the flour does dust-up. 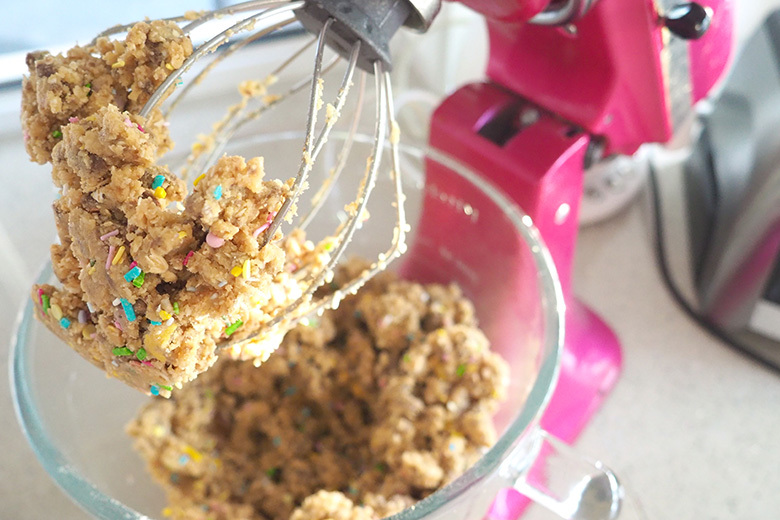 Make sure you shake the jar after each addition to level out the ingredients and pack the sugar layer down firmly. These Easter Cookies in a Jar gifts are also a great way to use up those left over Easter eggs. I blitzed 125g Cadbury Mini Eggs in the food processor to chop (I found this easier than by hand). 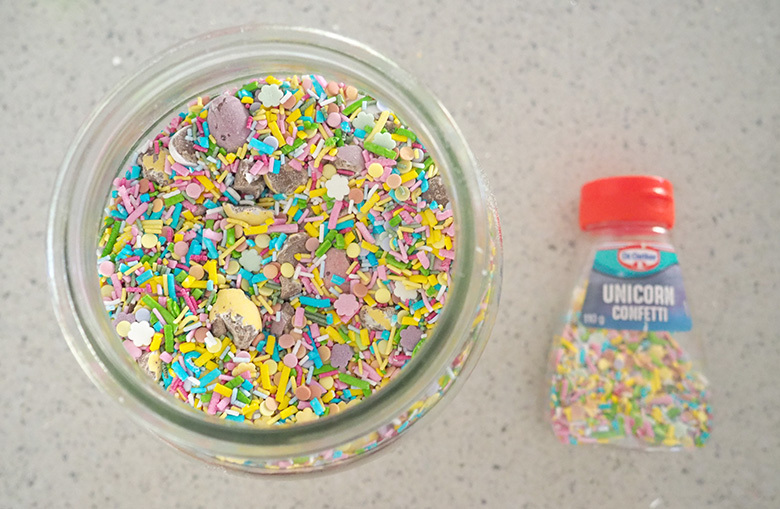 I added a layer of Unicorn Confetti to the chocolate, however you could use hundreds and thousands or sprinkles. Lastly, I crushed easter eggs on top to fill the jar – I used the big bunny, but you an use whatever eggs you have on hand. A word of warning! This batter tastes so good, so don’t even try it because once you start you will find it very hard to stop. 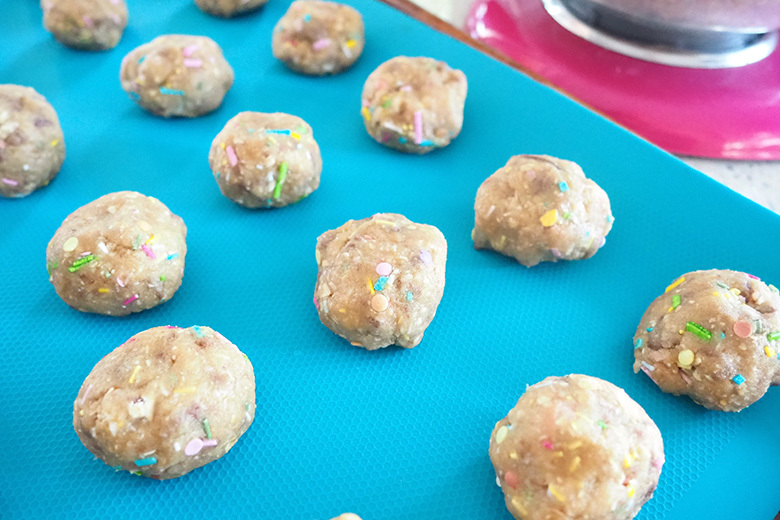 These DIY Easter cookies are really easy to make, and are especially great for new mums who love baking, but don’t have as much time on their hands to buy and prep ingredients. 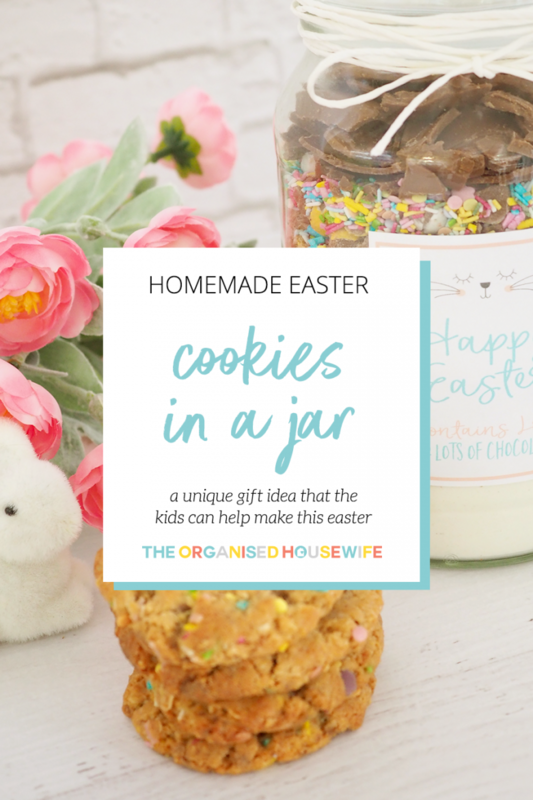 School holidays and Easter can be a really busy time, so I am guessing you want to create your gifts as quickly and easily as possible (I’m hoping my printable Easter Cookies in a Jar Labels will help to do this). If you’re really pushed for time, consider using the front Easter Cookies in a Jar Label (minus the back recipe label) and attach it to a jar of whole Easter eggs, or punch a hole in it and use it as a homemade gift tag. If you feel it’s not going to fit all the ingredients, it’s OK to reduce the sugar as these cookies are quite sweet. Decorate the jar with ribbon and Easter Label on front and cooking instructions on back. WHAT’S THE BEST HOMEMADE PRESENT YOU’VE EVER RECEIVED?